Carl Nielsen: Symphony #4 "Inextinguishable"
The Royal Stockholm Philharmonic under their chief conductor Sakari Oramo brought a delectable all-Scandinavian program for the 33rd installment of this year's BBC Proms. Two rarely played works, Jean Sibelius' 6th Symphony and Carl Nielsen's 4th Symphony, framed Edvard Grieg's ever-popular Piano Concerto. The soloist in the concerto was Alice Sara Ott in her Proms debut. What immediately struck in Oramo's conducting was his obvious familiarity with the repertory as well as his grip on the orchestra. Finnish Sakari Oramo has been chief conductor of the Swedish formation since 2008, combining that post with the one of chief conductor of the Finnish Radio Symphony Orchestra. He is not an unfamiliar face in the UK either, for between 1999 and 2008 he was music director of the City of Birmingham Symphony Orchestra. Oramo conducted the whole evening without score and performed both symphonies essentially as massive blocks, without any breaks between the movements. This approach emphasized the sweep of each work but also put the audience's focus to the test and the results were not always as convincing. The Sibelius Sixth, composed in 1922-23, may be one of the least played of all his symphonies, it is no less one of his most superbly crafted compositions. The classical structures are transcended with effortless and playful grace, while the whole symphony is woven as a delightful but intricate polyphonic framework. Oramo splendidly uncovered the limpid textures, aided by the orchestra's excellent strings, but his preference for swift tempi also robbed the symphony of some of its beauty and sense of mystery. Instead he installed from the outset a relentless climate of tension, quickly dismissing each possible hint at sentimentality and without ever wanting to achieve a balance with the moments of serenity that others (thinking for example of Herbert von Karajan) uncovered more eloquently. This worked better for Carl Nielsen's 4th Symphony, which received a thoroughly fascinating performance from start to end. The first of his two symphonies to be marked by the dismal experience of World War I, in the "Inextinguishable" (created in 1916) Nielsen still voiced belief in the vital life-forces and the endurance of humanity to overcome all obstacles. Oramo knows better than anyone to mold the variety of rhythms and conflicting tonalities of the symphony into a compelling, living whole. The Royal Stockholm Philharmonic with splendid strings and woodwinds, biting brass, formidable timpani, and breathing like one, was in this respect very much the ideal formation. Oramo secured an impeccable orchestral balance throughout, covering a thrilling dynamic range, yet without ever allowing one section to drown another. There were moments of ravishing orchestral color and drama, as in the delicate blending of the woodwinds in the "Poco allegretto", or the "Poco adagio quasi andante" where the cantilena of the massed violins is punctuated by the timpani before the lead violin is slowly emerging in a beautiful and poignant moment of respite. The final movement, hard-pressed with its battling doubled timpani, generated all the adrenaline and enthusiasm one could wish for. 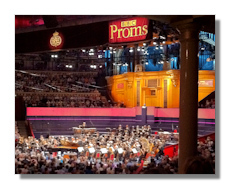 Edvard Grieg's piano concerto in A minor has been a Proms staple since 1898. In 1906 the composer himself attended a London performance of his concerto. It was a relief to hear the old warhorse performed with such freshness and consideration. Alice Sara Ott demonstrated breathtakingly delicate pianism in the opening phrases, making it clear from the start that she wasn't going to play the concerto merely to dazzle us. The Royal Albert Hall is a huge venue and especially when packed to capacity it may be tempting to showcase some truly "grand" piano, but this is not what Ott had in mind – and Oramo was completely on the same wavelength. Theirs was a subtle reading, cohesive and imaginative, mindful of the work's poetry and vivacity, but also boasting a revelatory sense of confidence and freedom which shed a different light on even the most familiar passages. Quite like with Franz Liszt's 1st Piano Concerto Ott contrasted the more tempestuous moments with genuine lyricism, which lingers at least as long (if not longer) as the bravura. In the reverie of the adagio piano and orchestra remained in a perfect dialogue, blending colors or simply accompanying each other. That she can unleash the power, when needed, was shown in the final movement. And in case anybody was still doubting, she returned one more time with a scintillating and crystal-clear rendition of Liszt's La Campanella,. An all-Nordic program, but Sweden had so far been absent from the set-list. Oramo made up for it by offering us a delightful encore with Hugo Alfvén's Dance of the Shepherdess from the Berga-Kungen (The Mountain King) Suite, sending everybody home with a smile.